At a press conference on Monday, NCAA president Mark Emmert emphasized that Penn State was being slapped with unprecedented sanctions because "our goal is not to be just punitive, but to make sure the university establishes an athletic culture and daily mindset in which football will never again be placed ahead of educating, nurturing, and protecting young people." Gotcha. OK, then. How's that message being received, now that it's been, oh, 50 hours or so for it to sink in? Well, Lane Kiffin already made it clear he wants Penn State's star running back. And now Penn State coach Bill O'Brien told ESPN that every one of his players has been contacted by other schools, and that some have been offered up to 50 other scholarships. The NCAA's sanctions allow PSU players to transfer without having to sit out a year, and the schools must inform Penn State of their intention to pursue players, which has resulted in a flurry of faxes and emails to Penn State's compliance office. At noon Wednesday, several groups of coaches from opposing teams were waiting in the Lasch Football Building parking lot to recruit Penn State players. "Our players are in our building right now and they don't want to leave the building because there are coaches from other schools in the parking lot waiting to see them," said O'Brien, who spent the morning at ESPN's Bristol, Conn., campus. As they boarded a plane Wednesday morning to go to Bristol, O'Brien and his colleagues walked past a group of six coaches carrying University of Illinois bags and suitcases. 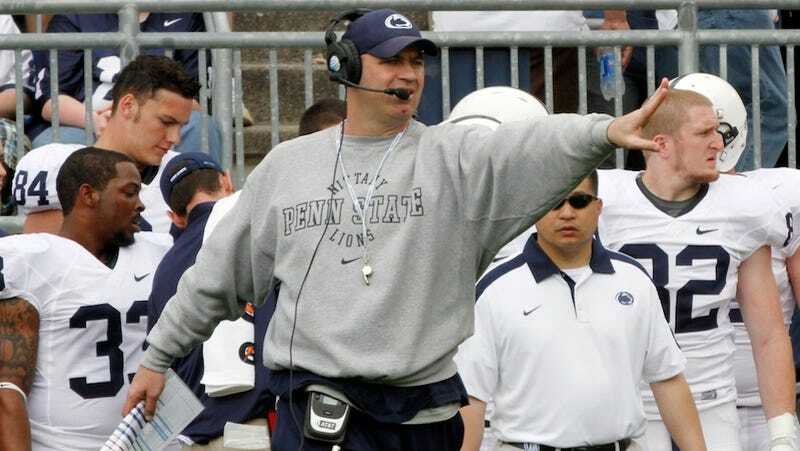 A Penn State official told ESPN.com that no words were exchanged between O'Brien and the Illinois contingent. ... Illinois assistant athletic director Kent Brown acknowledged a group of Fighting Illini coaches are on Penn State's campus to recruit "a player or two — maybe more." Just so we're clear: None of this has anything to do with those other coaches placing football "ahead of educating, nurturing, and protecting young people."